Gustavo Torres, director of Casa in Action, center, and others chant during a rally of immigration rights organizations, in front of the White House on Thursday. 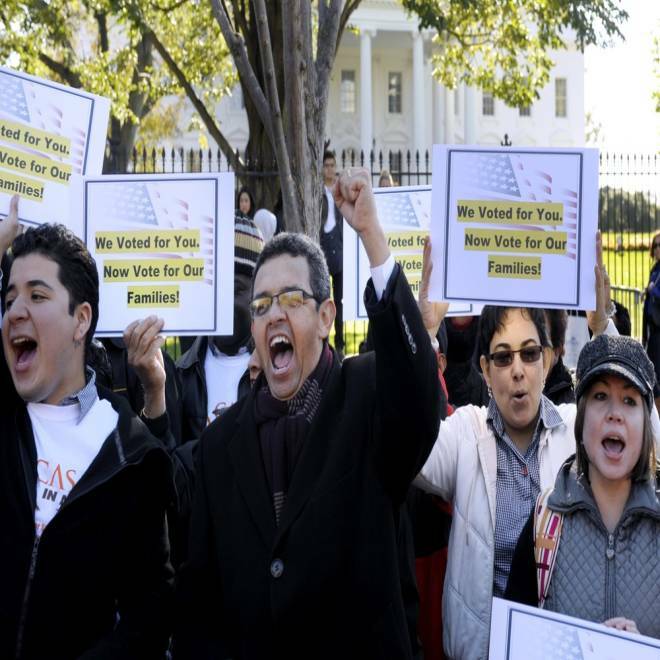 They called on President Barack Obama to fulfill his promise of passing comprehensive immigration reform. Hispanic voters, who were instrumental in putting Barack Obama back in the White House, now hope the president will work diligently in his second term to cross some big to-dos off their legislative wish list: jobs, affordable education, health care access and immigration reform. Hispanics voted for Obama over Mitt Romney by a resounding 71 percent to 27 percent and may have put him over the top in several key swing states. The total number of potential Hispanic voters this year reached a record 23.7 million – up about 80 percent since 2000 – and Hispanics now compose about 10 percent of the total electorate, according to the Pew Hispanic Center. “The Latino electorate arrived Tuesday, there’s no question about it,” said Rafael Collazo, director of political campaigns for the National Council of La Raza. The organization, which bills itself as the largest national Hispanic civil rights and advocacy organization in the United States, says it helped register more than 90,000 new Hispanic voters this year. “States like Florida, Colorado, Nevada, Pennsylvania, even Ohio -- the Latino vote was a net gain for the preferred candidate and was the deciding factor or at least very, very close to being the decisive factor,” Collazo told NBC News. "The Latino giant is wide awake, cranky and is taking names,” labor leader Eliseo Medina, of the Service Employees International Union, told NBC Latino. With the election behind them, Hispanics now want Obama and Congress to work on issues identified in surveys as their priorities – more jobs, affordable health care, access to higher education and immigration reform. The latter issue has been more important for Hispanics than for other U.S. voters, said Mark Hugo Lopez, associate director of the Pew Hispanic Center, a nonpartisan research organization. Hispanic support for Obama was high even before he announced in June that the government will stop deporting, and begin granting work permits to, some undocumented immigrants who entered the U.S. as children. “However, when it comes to asking Hispanics which party is more concerned for the Hispanic community, after the deferred action program was announced the (Democratic) share went from 45 to 61 percent – the highest we’ve measured in Pew Hispanic surveys in 10 years,” Lopez said. “In his acceptance speech, Obama mentioned that comprehensive immigration reform was something that needed to be addressed, and we’re going to hold him to that,” Collazo told NBC News. The day after the election, Senate Majority Leader Harry Reid promised to introduce an immigration reform package next year. He said if Republicans block the legislation, they would do so "at their peril." Al Cardenas, chairman of the American Conservative Union and former chairman of the Republican Party in Florida, agreed that the immigration debate has been detrimental for the GOP. A survey of Hispanic voters by the firm Latino Decisions found that Hispanics pushed Obama over the top in Colorado, Florida and Nevada, swing states where they turned out in unusually high numbers. Cardenas said the GOP can’t pay short shrift to minority groups if it wants to put a Republican in the White House. Country of origin: Among eligible Hispanic voters, 58 percent are Mexican Americans, 14 percent are Puerto Ricans, and 6 percent are Cubans. (The remainder are from Central and South America). Historically, Cubans have supported Republican candidates more than other Hispanic groups; in Florida this year, 49 percent of Cubans went for Obama and 47 percent for Romney. Youth: People ages 18-29 make up about a third of all eligible Hispanic voters, but just 20 percent of all general voters. Naturalized U.S. citizens: Among Hispanic eligible voters, 25 percent are immigrants who are naturalized. But among whites, only 3 percent are naturalized U.S. citizens. Callazo said that despite this diversity, Hispanics displayed a rather consistent, Democratic-leaning voting pattern across many states. “The numbers of how Latinos voted in Arizona compared to Ohio and Colorado were fairly close,” Callazo said. “Yes, there are differences and nuances … but if you look at the polling and all the anecdotal work and the outreach we’ve done over the years, the core issues are very, very similar," he added. "At end of day, Latino voters are voting for the candidate they feel will best reflect their values." NBC Latino contributed to this story.